The Delaney Dare needs a new leader—one from outside, after their own Alpha's actions led to the shifter war. Gage McAvoy has agreed to marry one of the previous Alpha's daughters and try to keep the dare from falling apart. Unfortunately, the daughter he's agreed to marry is not the one he wants. Never underestimate the power of an intelligent woman who has dedicated her very existence to giving the best acting performances of her life every single day. 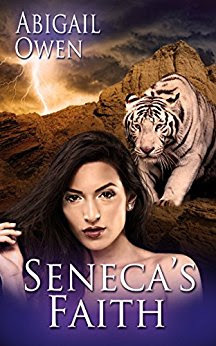 Seneca is a latent, non-alpha female in her twisted father’s pack. Not quite abused, but ignored day in and day out, life was lonely, but Seneca has a secret and the tenacity to morph into the personality she needs at any given moment. When she is drugged and kidnapped along with her future brother-in-law, little did she know history was about to made and alpha shifter Gage would play the starring role in her new existence! Seneca has the opportunity to go from wallflower to Warrior as the greatest battle in the shifter world is about to begin. But the war battling within her heart for the alpha who claims to be her soulmate burns like the raging flames of hell. Too many years of not being able to trust anyone have damaged her soul and Gage has the power to send her heart to the depths of despair or soaring high like an eagle in flight. Abigail Owen’s Seneca's Faith is a tension-filled tale of shifters, allegiances and learning to accept the differences of other clans. Fierce battles between beasts, magical talents for the right to live, love and laugh without fear of reprisals or the twisted vengeance of a power-hungry alpha. The secrets revealed will stun you! The love between mates will make you smile and the style of Abigail Owen’s writing will have you coming back for more! I have read the first two in the series and am so excited to get my hands on 3 and 4. I am even more happy to find that each one is as good as the last! Great review Dii.